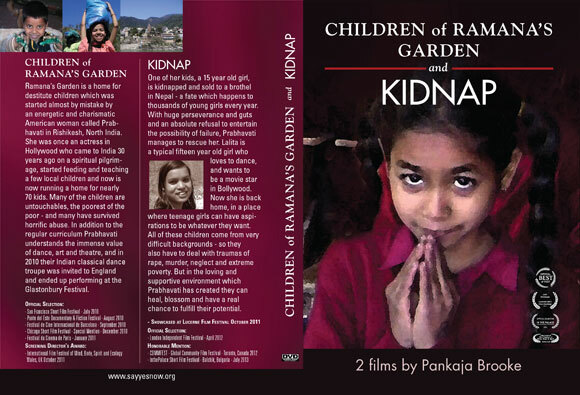 This DVD contains two movies made a couple of years apart, in the Ramana’s Garden home for destitute children in Rishikesh, North India. Children of Ramana’s Garden introduces us the children as they go about their daily lives in makeshift buildings perched on the bank of the sacred river Ganges, and to Prabhavati, an energetic and charismatic American woman who started the home some 20 years ago. Many of the children are untouchables, the poorest of the poor – and many have survived horrific abuse. As a Hollywood actress, who came to India 30 years ago on a spiritual pilgrimage, Prabhavati understands the immense therapeutic value of dance, art and theatre, and we see their classical Indian dance troupe rehearse, and follow them as they perform at a prestigious and expensive local hotel. Prabhavati managed to rescue her child. Lalita prefers modern dance to classical, and wants to be a Bollywood star – maybe she’ll be able to pursue her dream now she is back home. Prabha was heartbroken to leave the other girls, some as young as 11, in the brothel – but they were too afraid to leave. Some had been sold by their own families, who were too poor to feed all their children, others by men who tricked them into a false marriage.